WASHINGTON – When the FBI agent fires it on full automatic, the 56 assembled William & Mary students nearly jump out of their seats, although they’re safe behind bulletproof glass. A few moments later, another agent presses a button to instantly turn the glass opaque, just in time for the FBI director to walk in. It is an unusual classroom. Deep within the J. Edgar Hoover Building’s windowless hallways and security perimeters, James Comey ’82, LL.D. ’08 says “Hark upon the gale,” and the three classes of the William & Mary Washington Office’s D.C. Summer Institutes (DCSI) can calm down. They know they’re in friendly company. “This is something I’ve looked forward to all day,” says Comey, now in his second year as FBI director. He — and the DCSI faculty and staff — are engaged with helping these 56 undergraduates find success crossing the seemingly vast gap between student life and the world beyond. To that end, DCSI is a remarkable process, but Comey is a remarkable FBI director. In January, Jim Comey stood at the funeral of a New York police officer, Wenjian Liu, who was murdered in retaliation for the 2014 deaths of Eric Garner in Staten Island, N.Y., and Michael Brown in Ferguson, Mo. Comey decided then, amidst the pain of the victim’s family and the confusion of Liu’s fellow NYPD officers, that he was in a unique position to say something. 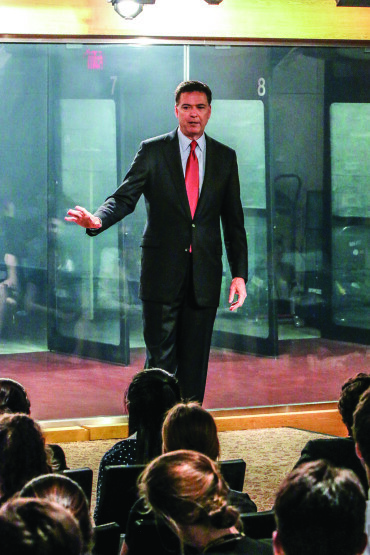 The next month, Comey took the stage at Georgetown University to speak about “hard truths” and the relationship between law enforcement and the diverse communities it protects. The speech, considered the first of its kind by an FBI director, was a measured look at some of the issues that underpinned violent protests in Ferguson, New York, and elsewhere. The New York Times called it “unusually candid” in its attempt to combat widespread “unconscious bias” and promote the “selfless service” of police officers at the same time. But the seeing must go both ways. Citizens of all races, Comey said, need to understand the challenges facing law enforcement as well. Then, in mid-April, Comey was invited to speak at the National Tribute Dinner for the United States Holocaust Memorial Museum. His remarks, reprinted the next day in the Washington Post, called the Holocaust “the most horrific display in world history of our humanity, of our capacity for evil and for moral surrender.” He also said that he requires all new FBI agents and analysts to visit the museum in order to gain a grim understanding of human nature’s horrific extremes. INTEGRITY: Comey cites his William & Mary liberal arts education as a major factor in his decision to commit to public service. They are the measured, thoughtful words of a man who has spent much of his career in the legal and law enforcement fields, but comes from a William & Mary religious studies background. Comey has served as the U.S. Attorney for the Southern District of New York — a critical precinct that includes Wall Street and Manhattan — and has held high-level positions in finance and at Lockheed Martin. During the George W. Bush administration, he was deputy attorney general, and was named FBI director by President Obama in June 2013. It all adds up to a wide variety of viewpoints. He tells the gathered William & Mary students to cultivate these important traits for their job searches. “When I hire, I care about the following things in the following order: values, abilities, skills,” he says. “Most people hire in the wrong direction.” Integrity, honesty, humility and empathy are the most critical traits. Leadership, as it turns out, is the theme of the summer for some of these students. A day later and a mile and a half away, just a few blocks from the whirling Dupont Circle, the DCSI students are having lunch. Among them is Drew Stelljes Ph.D. ’07, who is spending his fifth summer teaching a class on leadership and community engagement. FIELD TRIP: On May 19, all three classes of the 2015 D.C. Summer Institutes visit the J. Edgar Hoover Building in downtown Washington for the visit with Comey. That sort of personal envisioning is a critical part of DCSI’s purpose each summer. Adam Anthony ’87 is the director of the William & Mary Washington Office and has seen class after class of W&M students come through the nation’s capital for a transformative experience. Each student is here this summer through one of DCSI’s classes: some in Ron Rapoport’s American politics institute, others in Jeremy Stoddard’s new media institute, and still others learning from Stelljes. Comey’s question-and-answer session is a tough act to follow, but the visit to the FBI is truly just the beginning. Roxane Adler Hickey M.Ed. 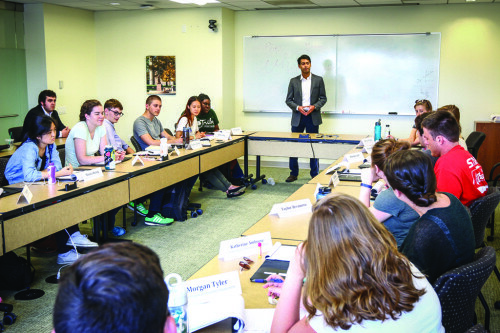 ’02 is assistant director at William & Mary’s Washington Office, and she is convinced that these visits — to the FBI and others like it — are keystone experiences for DCSI’s students. To do that, the Washington office staff works hard to help great minds meet: professors, students, mentors and alumni alike. First, the students learn from alumni all over Washington during site visits like the May trip to the FBI. For two weeks, these visits, along with seminar classes taught by professors in residence, dovetail into an intensive experience that Adler Hickey says is just as rigorous as any class in Williamsburg. Then, the students spend the remaining 10 weeks in a related internship, often facilitated by alumni connected with the D.C. office. Right now, William & Mary’s DCSI students are interns in a variety of Washington-area organizations, including the National Endowment for the Arts, Nike and the White House. Anthony has been director of the D.C. office since 2004, and has met with a dozen of these other universities looking to set up operations in Washington. Those networks make all the difference as students transition from undergraduates into job-seeking young alumni. Today’s guest speaker at a DCSI site visit is tomorrow’s internship connection, says Anthony. And from there, students can build relationships on their own. A seminar class at W&M’s Dupont Circle offices. During the Comey visit, the FBI director fields lots of questions on a variety of topics, but it’s easy to get the impression that many of the students want to come and work for him. “I can see [the Q&A] having a big influence and maybe pushing students toward public service,” says Anthony, who has seen students join fields in government, non-profit and private sectors alike. So just as Comey seeks to bring differing cultures and people together to increase understanding, DCSI requires a similar level of integration. This, he repeats, is the primary motivator in getting things done. You can’t talk your way into a productive, encouraging culture. You have to lead by example. For a man who has served in high-level positions in both Republican and Democratic administrations, a relentless focus on leadership and the proper perspective has helped him navigate today’s fractured political landscape. He explains how changing culture and humility have helped bring the two largest American intelligence organizations closer together despite years of bitter rivalry. The post-9/11 intel community would be unrecognizable to the old guard, he says: today the No. 2 person in the FBI’s national security branch is a CIA officer. The two organizations are now connected person-to-person on every level, like a zipper. 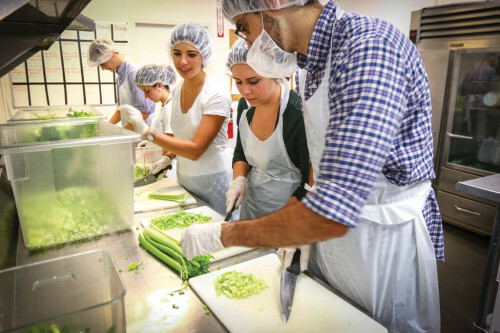 HANDS ON: During the summer, students visit a number of sites around Washington, including a trip to DC Central Kitchen. “I spent a lot of time thinking about ethics and studying different faiths,” he says. “Taking philosophy and stretching myself, I was learning to see the world through the eyes of others, which is what makes a great liberal arts education.” Comey hopes William & Mary never loses sight of those qualities. The FBI will have to continually change during Comey’s 10-year term. By 2023, even more of the threats facing America will come via the Internet, and the Bureau will need more people with the right expertise to fight them. If they can meet the coming challenges, William & Mary students can be part of that vanguard.